There's this interesting sentiment in Ayn Rand's The Fountainhead (that I still haven't finished reading) about how Greek and Roman classical architecture has just been copied over and over again through the ages - in wood, in stone, in marble, and finally, steel and glass. The point being that there's no more originality in architecture. This is not that magnetpost. After all, the same could be true of television and books and movies, and life, really. I for one, am always caught between not knowing if I like the classical stuff, or the modernist stuff or the whatever stuff. I tend to just like some design, and some not. No rhyme or reason for my tastes, but most likely attributable to not having any architectural training or education in this stuff, as someone pointed out to me today. 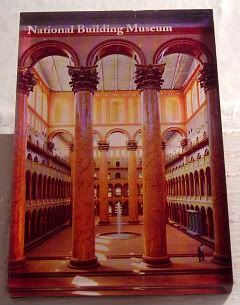 Anyway, the National Building Museum is a particular favorite of mine. Besides the really great tour, it's just an awesome building to wander around in, and filled with such history. It was designed by US Army Quartermaster General Montgomery C. Meigs a couple of decades after the Civil War. Meigs modeled the exterior after Michelangelo's Palazzo Farnese, while the interior was after the Palazzo della Cancelleria, both of which are listed here. And the Corinthian columns were inspired by the ones in Michelangelo's church, Santa Maria degli Angeli. Whew. What a mishmash. Still, it's totally one of the more interesting government buildings out there. It was the pensioners building! Can you imagine all the Civil War vets and civil servants filing in for their monies during the day, and then at night, the building being used for Washingtonian social gatherings? The building spent years as a government building before being repurposed with a new life as the National Building Museum Yes. Repurposed. Unlike other buildings we know - crackheads who destroyed Penn Station, I'm looking at you. Now, it's a forum for all things, well, building. Exhibitions, collections, seminars, events, tours, discussions, the works. From this magnet, you can see that they weren't joking calling this room the Great Hall - it's 316 feet x 116 feet, and like 159 feet at its pinnacle. You could play football games in here. For reals, yo. Well, ok, you'd have to ditch the 26-foot-fountain in the middle, but you catch my drift. Whoa. Check out gigantor Corinthian columns in the forefront (see little people to the right?) and toward the back. They're 75 feet high! Eight feet in diameter! Twenty-five feet circumference! Seriously! Of course, I was surprised during the tour to see that it was just bricks...painted to look like marble. Wha? I do love that on top of the Corinthians, there are 72 Doric columns on the ground floor, topped by 72 Ionic columns on the second floor. This room always gives me a giggle, because it reminds me of the school project that I didn't do back in elementary school. I haven't the faintest why we were learning about Doric, Ionic and Corinthian Columns in elementary school, but I distinctly remember the three types of columns on posterboard - complete with knife-sharpened pencil guidelines, beautifully hand-lettered labels, painstakingly drawn detailed sketches...by my dad. What? It's not like I didn't learn the difference between all three of them. I did! I did! hahahahah i love the building museum. if gordon and i had friends and tons of family that liked us... i would say ditch the italy wedding and get married there. also, i can't believe you let tatay do your homework. i think i had to draw my own columns myself! and why WERE we learning about the 3 types of columns??? Dude. I learned the lesson, didn't I? And I know the planets, and what color they are. And I know how the blood pumps through the heart. Though, I wrote the reports, thank you. But I *still* don't know why we were learning about columns.